In 10,000 m2 area, 20+ construction methods can be found, especially the applications of geosynthetics. Full scale demonstration boxes show the real cross section of different kinds of reinforced retaining walls. You can check them online via the Photosynthetic technology! 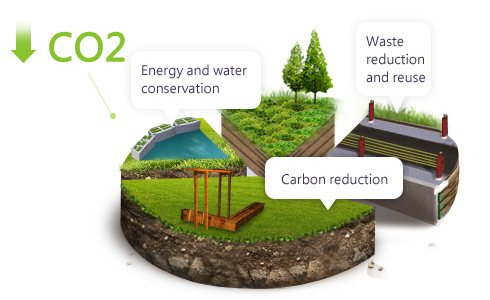 A verified life cycle assessment of carbon footprint on a reinforced embankment in accordance with PAS 2050:2011 was accomplished. See the tour video to get a quick tour of the park! This site is best viewed with Chrome 17,FireFox3.0,Internet Explorer 8.0 or higher,and screen resolution: 1280*1024. We sincerely invite you to visit the ACE Geosynthetics EcoPark. A one-hour tour is offered. Please complete and send out the following form 3 days prior to the tour date . Please fill in all columns marked *. We value your privacy and your enquiry. We will not pass your contact information to any third parties.